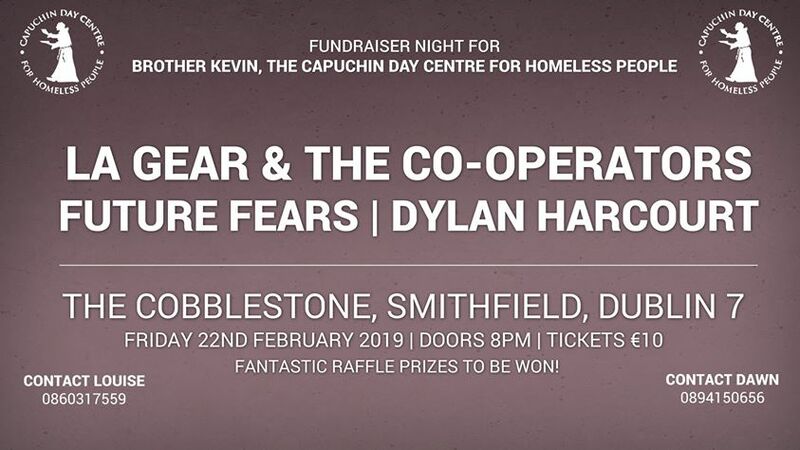 A night of great music in aid of Brother Kevin, the Capuchin Day Centre for Homeless People which will take place at The Cobblestone in Smithfield on Friday 22nd of February. Line-up on the night will be Dylan Harcourt, Future Fears and LA Gear & the Co-Operators. Doors open at 8pm and tickets are €10 or pay at the door.. There will also be fantastic raffle prizes to be won on the night.. For more information please contact Louise at 0860317559 or Dawn at 0894150656. Singer/ songwriter based in Dublin. Released debut album ‘Hermione’ March 22nd 2017. Future Fears are an alt-pop band from Dublin, Ireland. Formed in late 2015 the band has grown from strength to strength while developing a unique style of catchy hooks and anthemic choruses within their sound. In mid 2016 the band released their first single ‘Call My Name’ which was produced by Ray Traynor, who has worked with the likes of The Script, Aslan and One Republic. The band collaborated once again with Ray on their debut EP ‘Lucid’ in mid 2017 and following that with ‘Remedy’ which was released on March 23rd 2018. The past year has seen the band play in part of Ireland, gaining new fans while developing their set and mastering their craft. Dylan Harcourt is a singer songwriter from Dublin, Ireland. In his short time playing music he has already began making waves after releasing his debut single Sinking in October 2017 which JOE.ie made song of the day referring to it as ‘a toe-tapping ear worm’ and closely following with a sold out show in April 2018 for the launch of his EP. He has become well seasoned in his three years of playing performing to crowds of up to 4,000 and festivals such as LINGO, Ferrara Buskers Festival and Electric Picnic.